Each year, the Directing Change Program and Film Contest invites youth throughout California to submit 60-second films about suicide prevention and mental health. The goal of the program is to engage young people in learning about these critical health topics through the medium of film. The films are then used to support awareness, education, and advocacy efforts in schools and communities. 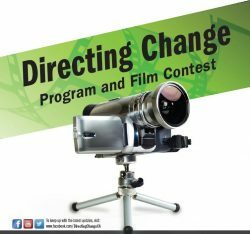 Directing Change is currently seeking judges to help select this year’s winning films. Do you have expertise or interest in directing, writing, editing, acting, journalism, video production, suicide prevention and/or mental health? Become a judge today! Participate in a brief 30-45 minute judging orientation (via phone or webinar) in February. Review up to 12 sixty-second film submissions and complete an online scoring form for each. The judging period will take place in mid-March 2019. The entire judging process will take less than 2 hours of your time and can be done online from home. Judges are recognized on the contest website and in the award ceremony program. Learn more at the Directing Change website or complete the online application here. The winning teams and their associated schools will win prizes, receive prevention programs and other resources for their schools, and attend the award ceremony at the end of the school year. See past submissions here. Directing Change is part of Each Mind Matters: California’s Mental Health Movement and statewide efforts to prevent suicide, reduce stigma and discrimination related to mental illness, and to promote the mental health and wellness of students. These initiatives are funded by counties through the Mental Health Services Act (Prop 63) and administered by the California Mental Health Services Authority (CalMHSA), an organization of county governments working to improve mental health outcomes for individuals, families and communities.